Final Fantasy XI is still very much alive, and Square Enix has just announced yet another new addition to the long-running MMORPG series to celebrate its 10th Anniversary. Final Fantasy XI: Seekers of Adoulin, which is the 5th exansion for the game, was revealed at the “A DECADE OF FINAL FANTASY XI VANA’FEST 2012” event held recently in Japan. There is neither a solid date other than 2013, or a price as of yet, but Square Enix has sent over some media and art along with the available details. Square Enix Co. Ltd. announced the development of FINAL FANTASY XI: Seekers of Adoulin as part of the FINAL FANTASY 10th Anniversary fan event, A DECADE OF FINAL FANTASY XI VANA’FEST 2012. Marking the fifth major addition to the FINAL FANTASY XI adventure, “Seekers of Adoulin” will feature two new jobs. Geomancers will harness the elemental energies of Vana’diel to aid their comrades and attack enemies alike. As versatile duelists, rune fencers will be quick with a blade as well as incantations, and employ the power of arcane runes to sway the tide of battle both offensively and defensively. New gameplay systems such as player-built outposts, new contract work, and the introduction of special “power spots” that are hidden throughout the environment for powerful character enhancements. Additionally, Kazushi Hagiwara, the internationally acclaimed manga artist, designed the artifact armor and weapons for the new jobs. His artwork will bring a fresh, new look that will seamlessly blend into the world of FINAL FANTASY XI. “A DECADE OF FINAL FANTASY XI VANA’FEST 2012” was a weekend-long fan event in Yokohama, Japan from June 23-24. FINAL FANTASY XI: Seekers of Adoulin will be available in North America on XBOX 360 and Windows PC platforms in 2013. 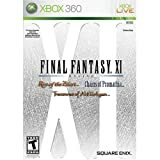 Detailed information on the title is available at http://www.playonline.com/ff11us/adoulin. Release date and pricing will be available closer to launch.